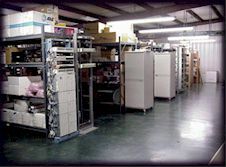 We Buy and Sell . . .
. . . new and refurbished central office , optical, data, and transmission equipment. We believe that we offer the best equipment and services you'll find anywhere. It is our policy at Central Office Systems to never alter or modify any product from its original state. We never misrepresent any product that we sell. All cards carry a one year replacement warranty or your money back. We Sell Experience and Provide Quality! All Trademarks are registered property of the individual company. We carry these quality brands PLUS many more! Copyright © 2001-2002 Central Office Systems All Rights Reserved.